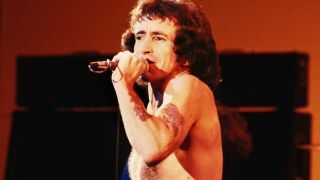 In January this year, it was revealed that a letter written by late AC/DC legend Bon Scott was to be auctioned. Scott wrote the letter to his friend Valerie in 1978 while the band were on tour across the US, and touches on several subjects including their tough touring schedule, his finances – and his concerns about the wellbeing of drummer Phil Rudd. The three-page document went under the hammer at Nate D. Sanders Auctions with a reserve price of $6500 – and sold to a mystery buyer for $14,000. And it’s now been revealed by News.com.au that it was purchased by the Western Australian Government. As for life on the road, he added: “We've worked so much since I saw you last that it's all one hell of a blur. Must have been across the country and up and down it a million times – I'm beginning to feel and look just a little haggard. The letter will be on display at the State Library in Perth for the next three weeks. AC/DC are the cover stars of the latest issue of Classic Rock magazine, which is on sale now. We take a look back at their 1979 album Highway To Hell, which was to be Scott's last with the band, to mark its 40th anniversary.